Time travelling back in time on X-Men TV classic series and movies is not really unusual. The revelation of Apocalypse primitive early life and Bishop’s mission to stop Apocalypse from spreading Techno-Organic virus which does not only infect mutant but also human—these were among of the stories that marked the comic-based Marvel’s X-men. Bishop also made several attempts with the help of Forge. And again time traveled to stop Professor X Xavier’s assassination as well as the U.S. Senator Robert Edward Kelly, these two is the key to stop discrimination and inequality between human and mutants. Bishop notably teamed up with X-men and Cable to fix the disaster that is happening on the future. Active opposition, deaths, hatred and violence that were created by the thread of past events. Travelling in the past got its vice-versa—mutants were sent to get involved in the future happenings. Professor X, Jean Grey and other psychic mutants have also the ability to see the future. This later revealed that the top threat not only for the mutants but the entire humanity was disclosed. The existence that once thought vanished—sentinels lead by Master Mold. There’s no doubt that past and present greatly impact the future. This year, 20th Century Fox brings a new thrill of intense sci-fi action with the X-men. X-MEN: Days of Future Past, a battle of survival between the two timelines—reunited with their younger selves. How will they commence the duel to change the past? Will the mutantkind hunt down and destroy? For one thing is certain, human and mutants are considered to be the same. Our life is always based in a scientific law. I guess, this could also be applied on the divine law. The law says, “Every action has an equal and opposite reaction.” Have you remember this on your Physics? I had done a lot of mischievous deeds. The current evidence shows the results. If I only have ways to twist them back for good. However, if there is one thing I want to correct from my past to save my future? Well, that maybe a chance and talk to my parents to invest for my college education. My dad was really old enough when I was back there in high school. He also got frustrated to some of my older siblings. Most of them were unfortunate to complete their studies. Being engaged and caught on the loop of early not-so-serious relationship. This led for my father’s negativity to pursue the younger ones. I want to sue them before but it may only cause another misunderstanding. Since there’s just no other choice, I stood up and make my own steps moving forward. I will never allow myself to be dragged by the same fate—the negativity. Right now, I’m seizing every opportunity the life has to offer. I’m leaving the past behind, obtain experiences, learn lessons from challenges. Despite some of my incapability, who knows? Maybe I can be a better person someday and I'm looking forward into it! Anyway, let’s watch X-Men: Days of Future Past this May 23, Friday, 9:50 pm at Shargri-La Cineplex Cinema 1! For sure guys this one is the best way to cool down from the summer sun. Thanks for reading, don’t forget to share us your past, “tell us why and how will you change it?” Just leave it in the comments box below. 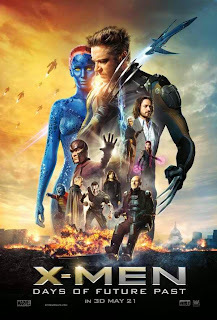 Thank you for reading X-MEN: Days of Future Past posted on the website Kwentology if you want to redistribute this article please include the link as the source. Have some kuwento to share? Contact us!